The first buttress looked disappointingly lichenous but you only had to look across the splendid green and golden valley stretching forth to know your time would not be wasted. A few seconds later we spied the Big Brother Buttress which revealed the Edge's true climbing potential on black, finely grained gritstone, around 16m in height with a solid sculpted look. We were visiting Derbyshire's own forbidden mountain. In fact we were lucky to be there. On Monday April 25th 1932 the Mass Trespass of Kinder took place with the call made to take action ‘to open up the fine country at present denied us’. Access to Kinder had formerly been the preserve of the adventurous with the masses prevented from enjoying this wild and barren landscape. Walking up there it was a pleasure to be listening to the gentle gurgling stream and spare a thought for the 400 to 500 ramblers marching for something they really believed in access for more than the privileged few. Ultimately it marked a victory for those who love open spaces. It must have been very exciting, I could almost imagine the vigorous hand-to-hand struggles or fisticuffs with keepers on the walk up as a rustle in the bracken turned out only to be a large bird. Last year saw the event's 70th anniversary where the Duke of Devonshire, the largest landowner in the Peak District speaking at a Ramblers' Association event said: "The trespass was a great shaming event on my family, and the sentences handed down were appalling. But out of great evil can come great good. The trespass was the first event in the whole movement of access to the countryside and the creation of our National Parks." He was reported on the Ramblers' Association website to have made a dignified apology for the conduct of his grandfather during the Kinder Scout mass trespass where five young men were imprisoned. An hour's walk, but well worth it to escape any oppressive heat and inevitable warm rock and that ‘slimy hands’ feeling. Ashop Edge faces predominantly north and at an altitude of 550m promised to be the perfect place. J W Puttrell made the first recorded pioneering ascents with friends in 1901. It almost made me want to rush off back home for a hemp rope (and a set of period clothes a la Hard Grit video) that's if he used one. 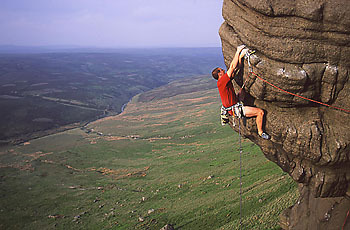 Some re-enacting would add a new dimension to the day's climbing, particularly considering the boldness that these early routes would have demanded using very little or no recognizable equipment. The late '50s and early '60s saw another surge in development in which several routes came into being by the likes of Malc Baxter and development has continued with now only a few hard lines remaining to be done. Many others had had the same idea of visiting Ashop that day and it would take a walk for 400m to ditch the crowds along an edge that is well worth exploring fully. It has a good spread of routes with the majority being around VS. Starting as for the old classic of Legacy, this route then climbs the centre of the wall with the crux negotiating a vertical crack by jamming or otherwise. A superb quality climb. An exciting route, great fingery climbing above perfect gear culminates in a crux lock move or a powerful dyno to a break at a height that might leave one wondering whether a fall would put on the ground. A must do if you dare. This route traverses across The Savage Breast and for its grade it is an unlikely line. 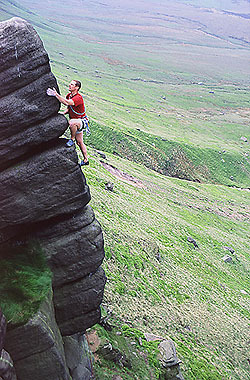 It has fantastic moves and stays continually interesting after traversing right and finishing up the arête. This interestingly named route threatened to repel all comers, a tricky number that is more technical than hard. A few moments pondering the right sequence may pay dividends. It ascends the wall with the crux at the top. Surprisingly good climbing with an inescapable and somewhat urgent finish. 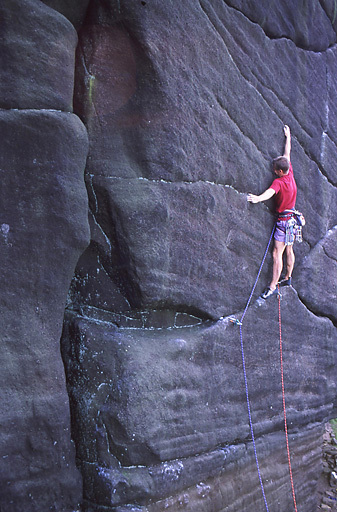 Some of the finest pure hand jamming on the Edge, unfortunately the crux is gaining the crack itself. Climbs pleasantly up past several breaks to the last move which is challenging for the short requiring more finger strength than the grade would suggest but a distinct sense of satisfaction on summiting. It starts virtually at the top of the crag on the last move of Woe is Me (Severe), and manages to pack in a lot of climbing. The crux is an increasingly difficult traverse left above the roof on decreasingly useful slopers with perfect gear, if you can stop and place it, to finish direct. 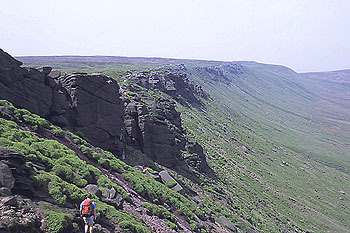 Kinder (BMC) edited by Geoff Milburn. Contains an interesting introduction to the area and some excellent old photographs of Peak climbing as well as full route descriptions. This article, by Anne Arran, first appeared in the December 2003 issue of High Mountain magazine.